Our Large Cotton Eye Pillow will help to quiet the mind and relax the body by blocking out light, providing a slight weight over the eyes, and filling head space with the soothing scent of lavender. Our eye pillows are removable, machine washable, and made from 100% cotton. The pillow is filled with organic flax seed and dried lavender blossoms. Lavender is renowned for it's calming aromatherapeutic benefits and can help to alleviate headaches. Perfect for restorative yoga or prolonging meditation and savasana. Priced wholesale and also available with a silk case. Pro Tip: Place in microwave for 30 seconds to one minute to make a warm compress. Or, invigorate your mind with a cold eye pillow: place in freezer for at least two hours. Lavender scent will be prolonged when stored in a ziplock bag. 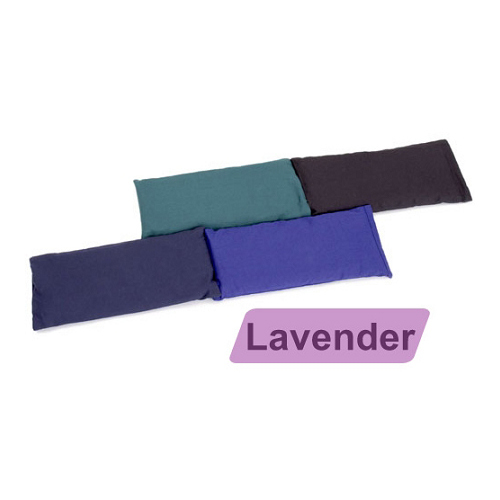 This lavender scented eye pillow, is perfect for tired eyes or an aching head, or simply to aid relaxation. It smells divine and I love it. I was so impressed next day delivery.